Star Wars Battlefront II, Get It DRM Free - KABALYERO - PLAY, BLOG & EARN! Star Wars Battlefront II is already a classic Star Wars game and you can now get it DRM Free. Star Wars Battlefront II was first release in 2005. It's now 2015 and it's still a great Star Wars game to play. The graphics of the game may feel a bit dated now and look a bit edgy or blocky but it can still hold up against most free-to-play titles today. Besides, Star Wars Battlefront II was never about the graphics. It was all about gameplay. Fight as a Jedi, Battle In Space, Expore The Galaxy and more. 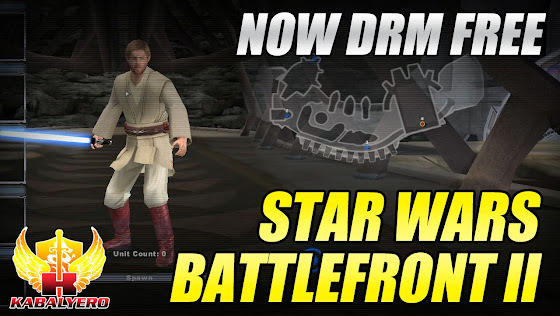 Anyway, you can now get Star Wars Battlefront II DRM Free and the link is in the description of the video below or you can simply click here.